The Assertiveness Guide for Women brings up a topic that I don’t take lightly, how to communicate your needs, wants, thoughts, feelings, and set healthy boundaries to create strong relationships are really important. 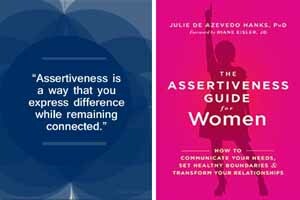 I consider Julie de Azevedo covered assertiveness in this book pretty well, from what’s assertiveness to discontinue a relationship with people that ‘should’ be in one’s life if it’s necessary. CHAPTER ONE. What does it mean to be assertive? The book has exercises and tools to create awareness and practice assertiveness. The author provides different tools that help to manage relationships with people that are open to talk about what’s bothering in the relationship or people to avoid because they don’t respect boundaries. Assertiveness can still have room for improvement even growing up or living in a good healthy setting. On the other hand, stress-related illnesses can be the result of resentment and distress caused by environments where is difficult to assert the self or coupe with the abuse that affects organs like the liver and the adrenal glands due to living in a fight or flight mode (survival mode) chronically. Julie de Azevedo writes about toxic people, “these individuals are toxic because they poison the people around them.” However, it takes awareness to realize the somatization of bottled negative emotions and act saying no and setting healthy boundaries. Moreover, in extreme cases, it doesn’t mean it’s easy as abusive people want to perpetuate the abuse but health, safety, and overall well-being are worth it. It is impossible to take back all the wasted time because of these people abusive behavior, but it feels great when it’s over. I love this book; assertiveness is a topic that touches my heart deeply, because of it, I have created a safer environment to live my life, and the sense of relief is huge, as leaving abusive situations unattended can escalate to attract more abusive relationships and spoiled the good ones. Furthermore, practising assertiveness is vital for it’s important to be connected with healthy people and attract healthy relationships.